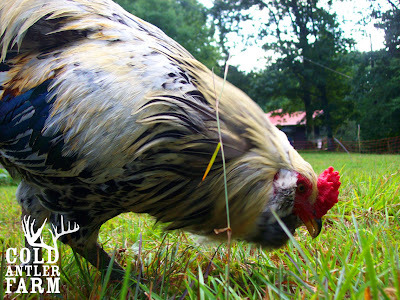 coldantlerfarm: strum & cluck anyone? I have decided to forgo Antlerstock 2009. There were a handful of dedicated folks who wanted to swing by, and if you were one of them don't fret. The Saturday of Columbus Day weekend will still be an open house of sorts, but it will also be the day of the Cluck & Strum. I have decided to plan the first ever future-farm fundraiser for that beautiful weekend. If you are interested in a full day (10AM-4PM) session on beginner mountain dulcimer and keeping chickens: mark your calendars. If you sign up for the fundraiser you'll get a copy of Storey's Guide to Raising Chickens and an Apple Creek Student Dulcimer. So you come to the farm, get a full day of intro-to-chickens tours, animals in your hands, lectures and such and the afternoon will be learning to strum around a campfire at the farm. You leave with a book and a musical instrument. (If you already have a dulcimer and want to attend, the price of the apple creek will be removed from the donation. Roughly $70) Lunch will be provided and I am limiting it to ten people. So if you are interested contact me at jenna@itsafarwalk.com and put "Cluck & Strum" in the subject line to find out the details. Now, if you wanted to stop by for Antlerstock, but have no interest in a chicken/dulcimer workshop. That is fine and you'll need to email me as well to let me know you may swing by while we're out there pluckin' and cluckin'. Jenna, where in VT are you? I need to figure out drivetime to know if it is do-able for me. I'm south of Boston MA. LOL, Tara! Good idea. Jenna, I so wish I could do this one, but it's just too far for me to drive myself and no one here interested in going with. I will love to hear all the details when it's over. I know you guys are going to have a great day. Maybe we can send some home made wine for the campfire? I ain't pluckin' nothin' that's alive and cluckin'! southwestern VT, email me if you need info darcie. fallen oak, i'm a vegetarian for now, so nothing's clucking will be plucked. I wish I was in a different place in life where this was possible. Too many kids, not enough weekends. I almost hated turning the page to Sept and seeing the stuff stacked up on the calendar already!! I really wish the Baltimore Comic Con was another day. Maybe if one of my favorite writers wasn't going to be there I'd be able to delay leaving long enough to come, but I just can't do it. If you ever want to split the ride to Vermont, I am "just up the road from you" about an hour and a half up I86, formerly, and in my mind still, Rt. 17, "the expressway!" I won't be able to go that weekend, either, but if ever we can swing it at the same time, we could share the ride. Just a thought. I sure would like to be able to go! I love old fashioned music jams outside around a campfire, and I want to learn about chickens, I hope to be ready to get my own soon. But...I live in Illinois, too far away, and my job situation isn't good enough to take the time off. Maybe next year things will be better! I was just wondering what kind of a rooster he is in the picture? He sure is pretty. Stac: Albany is only an hour away. Berry: that's chuck klosterman, he's an Ameraucana. darcie, it took me 4 1/2 hours to drive to boston last fall. not too shabby. you could get up early and get a room and make it a holiday! No way I can make it - I live on the opposite side of the country. But I wanted to tell you that when I read this post when you first put it up I decided to buy myself a dulcimer and see if I can learn on my own. The UPS brought it today and I tried it out a little. Will be a long time I'm sure before I am any good, but my cat seemed to think it was soothing anyway. :) So thank you Jenna for inspiring me to try to make some music of my own.